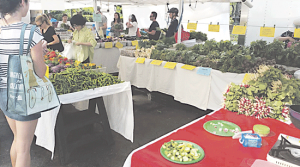 Improving sales at a farmers market stand can feel like a daunting task. Customers stream by without making eye contact or they stop and ask a question, only to walk away without purchasing anything. Speakers at a recent direct marketing conference hosted by Cornell Cooperative Extension provided cost-effective strategies that can help every farm increase sales. 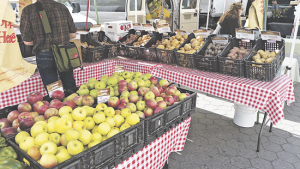 “We have seen a huge proliferation of farmers markets in recent years, but not an increase in sales,” said Christopher Wayne, director of FARMroots. 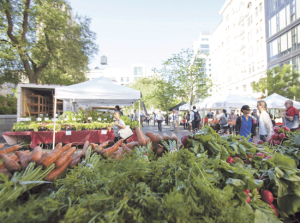 The program offers a wide range of beginning farmer programming as well as technical assistance support for established producers through GrowNYC. The FARMroots project was designed to leverage internal institutional knowledge and customer research performed by grocery stores and large-scale food retailers. Commercial food sellers have invested heavily to collect thousands of data points to better understand what tactics encourage shoppers to buy more. The key to increasing sales is to encourage more people to move from exposure through to purchases, Wayne explained. From that information the program developed strategies farmers can use to increase sales and customer satisfaction. Use bright colors and create dimension. Large-scale retailers know that yellow is the color the human eye can see at the farthest distance, according to Wayne. Placing yellow in the corner of a set up draws a customer’s eye into the stand. “Take a black crate that you usually lay flat down on the table and use a block underneath the back so it gives it a little angle. That goes a long way in catching a customer’s attention,” he said. Create a sense of abundance. Keep displays full to increase purchases. Sparse displays lead customers to believe they are getting the leftovers and that discourages a sale. Encourage loyalty. Nearly every retailer offers a loyalty program. Use punch cards that reward customers for making repeat sales. Those combined increases totaled nearly $600,000 for the participating farmers. The strategies they used made it easier for customers to navigate their booth, reduce shopping anxiety and maximized displays based on consumer shopping habits. Best of all, the display adjustments were inexpensive and easy to implement. Funding originally through the National Farm Viability Institute and more recently the Farmers Market Promotion Program through the USDA made this project possible.